School mornings are always somewhat crazy in our home. It doesn’t matter how much we prepare–whether it’s making breakfast in advance or setting out clothes the night before school–mornings will also be sprinkled with a dash of crazy unpredictability. Last week, this craziness showed up in the form of very bad traffic on the way to school. We eventually made it to school, about 30 minutes late. This week, this touch of craziness included the dog getting sick in the house just as we were about to leave for school. Ah yes, life, my friend. It’s no where near perfect, because perfect doesn’t exist. It’s because of this imperfect craziness that I’m such a proponent for being intentionally prepared before the morning arrives. For us, this looks like having breakfast and lunch components prepped and ready to enjoy. I know, I’m always talking about prep. And it’s for good reason. Prep simplifies our life. Prep reduces my stress, as head cook. And stress makes those unexpected bumps, which are sure to come during the week, easier to get over. Because no one needs the added burden of having to figure out how to create a from-scratch meal at 7am each morning, on top of feeling rushed and stressed because of a mess in the kitchen. Oh, and then add a sick dog in the mix. No, thank you! For breakfast, I have a few go-to meal components that I like to prep on the weekend. These rotational options usually include: muffins, waffles, overnight oats, granola, and eggs. I don’t make everything each week, just a couple of items that can be paired with simple foods, such as: smoothies, plain yogurt, fruit, and scrambled eggs. We also get sourdough from a local bakery every two weeks which makes for great toast in the morning. Lately, on Sunday, I’ve been prepping a batch of hardboiled eggs. In the past, I’ve made the eggs on the stove-top, as I’ve done for years now. I’ve experienced mixed results with the stove-top method, particularly when dealing with fresh eggs from a local farm. There are rare times when my eggs end up perfect. But most of the time, the eggs either don’t peel well or end up with chalky yolks due to over-cooking. The Instant Pot has been a complete egg game-changer. I think it’s worthwhile to pick up an Instant Pot just for making beans and eggs. 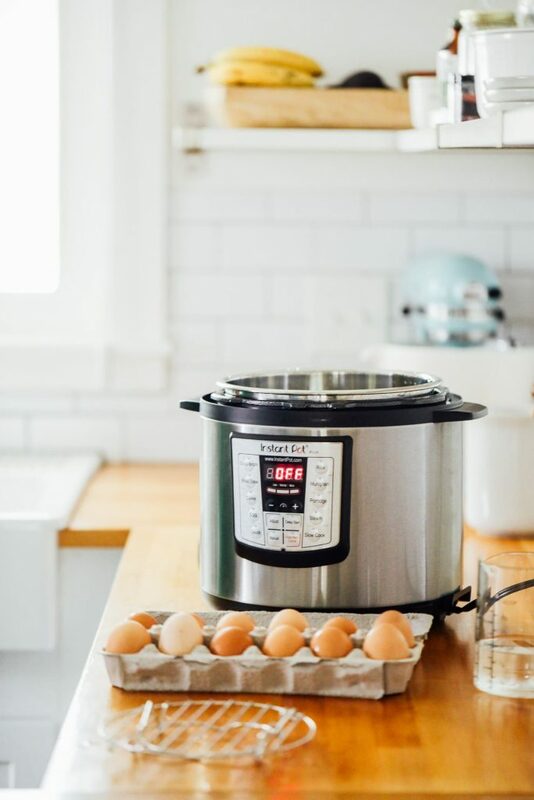 There are also many other delicious recipes you can make in the Instant Pot, in a fraction of the time or in a hands-off nature compared to stove-top or slow-cooker methods. Bottom line: If you don’t have an Instant Pot yet, you need one. Put in on your Christmas list, save up for it, beg your husband for one (nicely). 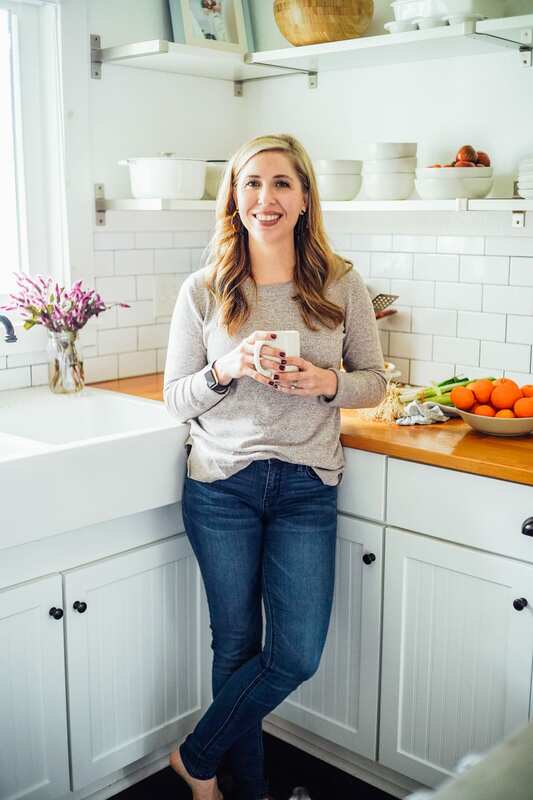 The Instant Pot has been a total game-changer for me in the kitchen. And I’m not paid anything to gush over this appliance. I honestly, seriously, 100% love my Instant Pot. 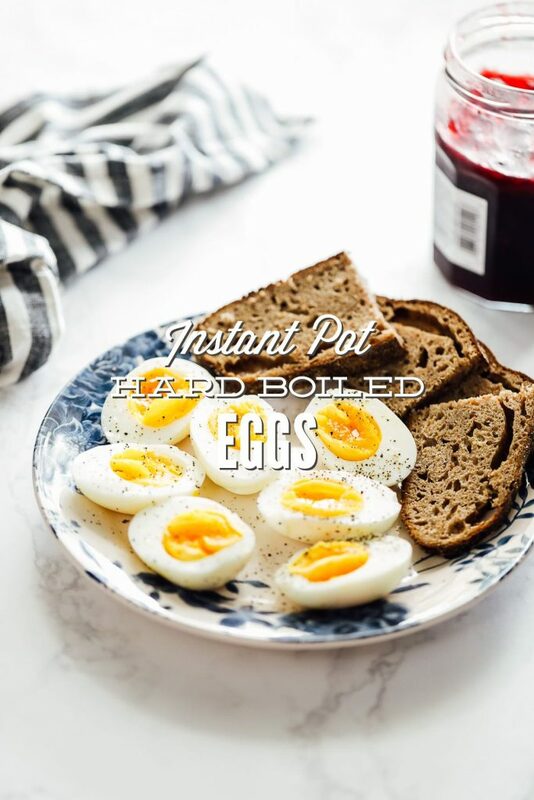 It takes a total of 3-5 minutes to make soft or hard boiled eggs in the Instant Pot. That’s it! You can make the eggs in advance, say on a Sunday, and store the eggs in the fridge for a week. I use these eggs as school snacks, paired with another breakfast option for breakfast, and in the lunchbox. If you don’t want to make the eggs in advance, you can also easily make a few eggs on a as-needed basis. The amount of time you cook the eggs will depend on the yolk consistency desired. For soft eggs, with a slightly runny and also slightly firm yolk consistency, I go with 3 minutes. For eggs with a soft yolk but also firm enough to store well in the fridge, I go with 4 minutes. And for a completely cooked yolk, go with 5 minutes. I prefer a quick release, since this stops the egg yolks from cooking any further. If you like a very cooked, solid yolk, you can also let the pressure naturally release in the pot for 5 minutes and then perform a quick release after this time is up. 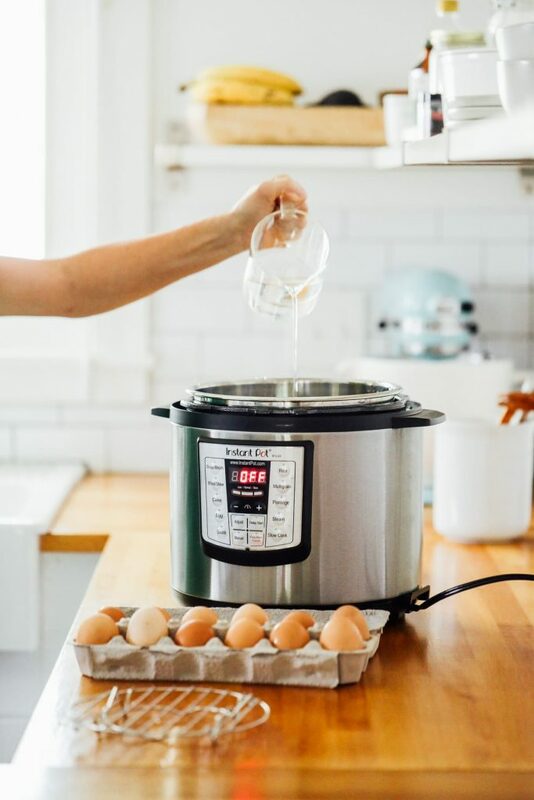 Whichever time you choose, I know you’ll love the instant nature of cooking eggs in the Instant Pot. 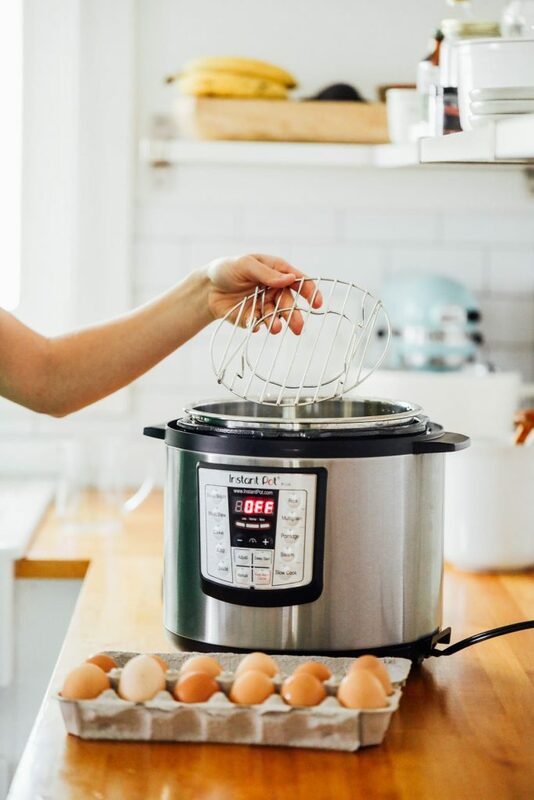 How to make the best soft and hard boiled eggs in the Instant Pot (or electric pressure cooker of your choice). A method that takes less than 10 minutes total, and most of that time is completely hands-off. Instant Pot Trivet Rack This should have come with your Instant Pot. You can also purchase a rack separately. Place the trivet rack on the bottom of the Instant Pot liner. Place as many eggs as desired on top of the trivet rack. I find that 8 is the most I can fit on the trivet rack, which is why I recommended 8. You can cook as many or as few as desired. The water will not touch the eggs. Secure the lid and set to Sealing. Set to Manual, High Pressure for 3 minutes for a soft and slightly runny yolk, 4 minutes for a slightly soft and slightly firm yolk, or 5 minutes for a firm and cooked yolk (hard boiled). While the eggs cook, prepare an ice bath. Fill a large bowl with cold water and add several ice cubes to the water. 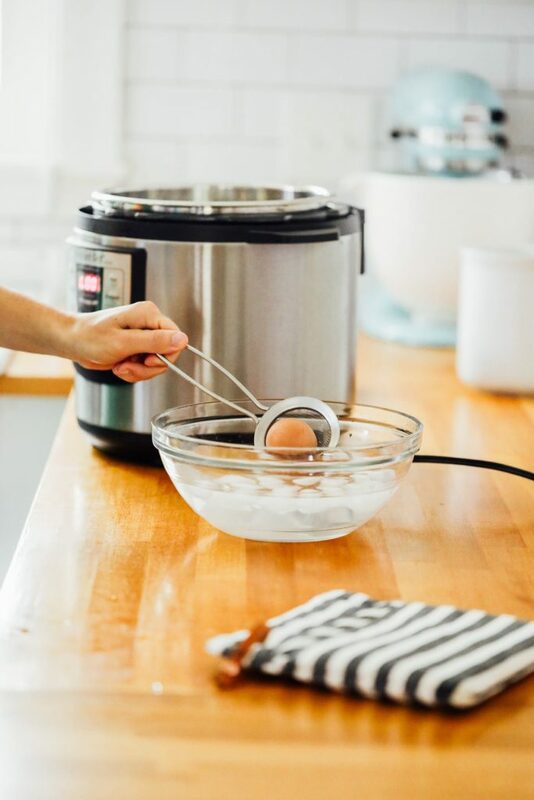 Remove the eggs from the Instant Pot and place them in the ice bath. A large spoon or measuring cup works well, or a small sieve. As soon as the cooking time is over, perform a quick release (use a towel or hot pad holder). 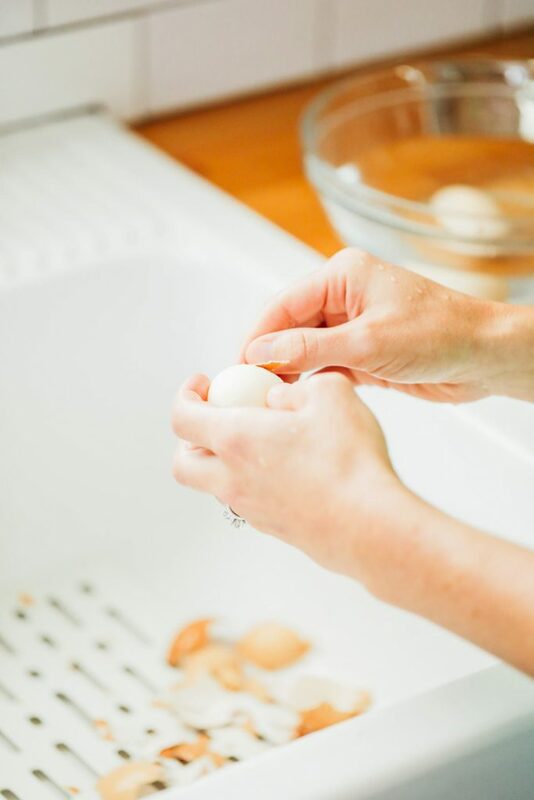 Allow the eggs to rest in the ice bath for 5 minutes, then remove and peel. I find it's easiest to remove the shells under running water. 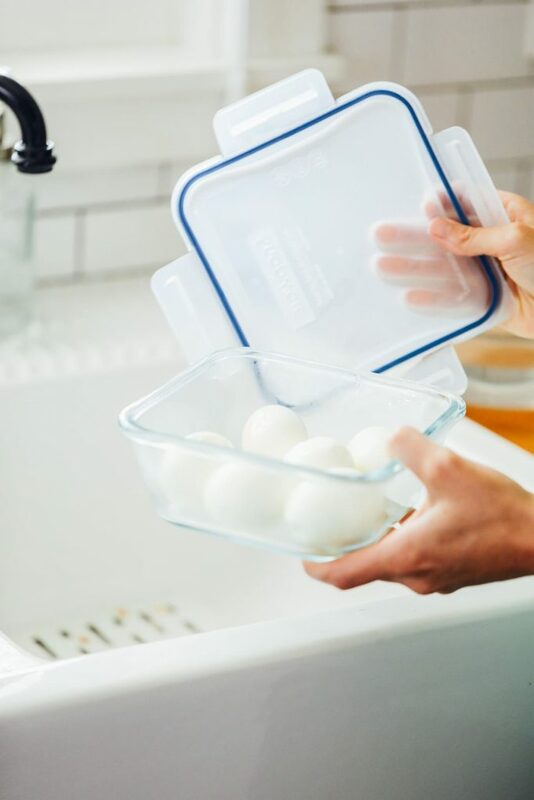 Store the eggs in a container with a lid in the fridge for up to a week. Eggs Cracking: If your eggs crack or "explode" in the Instant Pot, it's because they're too cold. This usually occurs because the eggs are coming straight from the fridge. To fix this issue, place the eggs in a bowl of warm water for a few minutes before placing the eggs in the Instant Pot. Or, take your eggs out and allow them to sit at room temperature for about 10 minutes before cooking in the Instant Pot. I’m going to have to give this method a try! I like my stovetop method, but it can be pretty difficult to peel the eggs. Oh yes, Erica Lea! The Instant Pot is just amazing for eggs. Once you try it, it’s hard to ever go back to the stove-top. Thanks, Linda! Glad you enjoyed the eggs. Wow! I literally just made these. 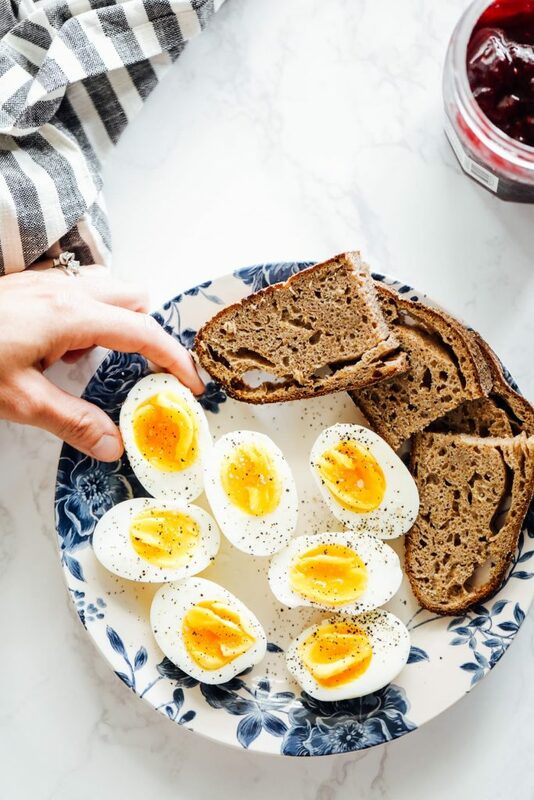 This has to be, hands down, the easiest batch of hard boiled eggs I have ever made! I love hard boiled eggs, but rarely make them, because they never really turn out right, and inevitably one cracks on me. But this time, the eggs came out perfectly. I’m in love. As if I needed one more reason to love my Instant Pot! Thanks for the awesome recipe, Kristin. And thanks for making real food so much fun and so attainable. That’s awesome, Emily! 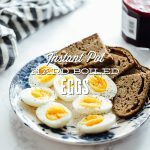 I’m so glad you’re loving the eggs and your Instant Pot. This is sooooo easy!! Coming from a person who has messed up boiled eggs a thousand times. My favorite time is 2 mins, slightly runny but solid at the same time.